A group of Kenilworth swimmers have started a petition to save the outdoor swimming pool in Abbey Fields over fears it may close as part of leisure centre improvements. The fears were raised after a draft version of part of the Kenilworth Neighbourhood Plan - specifically about green infrastructure - suggested the outdoor pool was ‘not economically viable’ and claimed ‘there was much pressure to replace it’. And now Kenilworth resident Jane Green, on behalf of the new group ‘Save Our Outdoor Pool’, has drafted a petition to drum up support for it. Jane, a keen swimmer, recently moved to Kenilworth partly because of the presence of the outdoor pool. She said: “It makes the absolute world of difference to be able to get up, go outside and have a swim in the morning - it feels like you’ve had a blood transfusion and you just feel really great. Another Kenilworth resident, Joanna Sifton, also spoke highly of the pool. She said: “The outdoor pool is the reason my husband and I moved to the Kenilworth area 16 years ago. Outdoor swimming is a very rewarding and healthy activity. “I appreciate that running the outdoor pool has economic implications, but the current providers do not utilise the pool to its advantage. Warwick District Council plans to improve the facilities at Abbey Fields as well as Castle Farm, but no formal plans have been submitted yet. 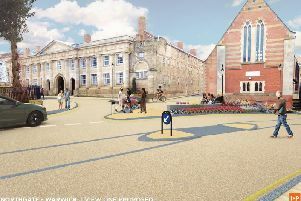 Cllr Michael Coker, portfolio holder for culture at the council, said: “The current position is that there is no formal plan for Abbey Fields or Castle Farm because we don’t really know what it would entail until the Local Plan is confirmed. “No decisions have been made at this stage, so a petition feels somewhat premature. “It’s fair to say that the outdoor pool is less used because of the weather and so forth. “Obviously we will try to maximise its use to get as much as possible out of it. If the pool was to close, the nearest outdoor pools to Kenilworth are in Chipping Norton in Oxfordshire and Cheltenham in Gloucestershire. A formal consultation on the improvements is set to take place either in December 2016 or January 2017.